How Can Social Marketing Be Used to Achieve Universal Access to Reproductive Health Services and Begin to Achieve MDG5? Karl Hofman, President and CEO of Population Services International (PSI), argues that social marketing can be used to dramatically improve the health and lives of women—and more specifically, that social marketing can be used to address the massive unmet need for family planning services around the world. Visit the Population Services International (PSI) site here. To read Karl Hofman’s bio, click here. 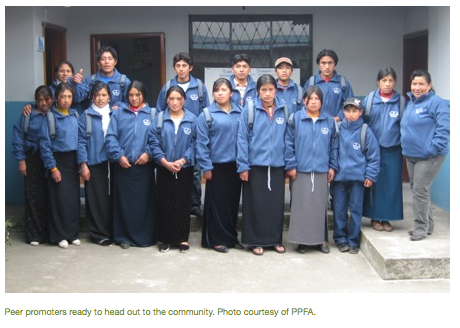 Planned Parenthood Federation of America and CEMOPLAF, an Ecuadorian reproductive health organization, are working together to train Ecuadorian teens to become community health workers in the Chimborazo region of central Ecuador. “Ecuador has the highest adolescent fertility rate in Latin America, and this skyrockets when we’re talking about rural or indigenous youth. Among community members in the region here, just 6 percent of women and 12 percent of men reported contraceptive use, while less than half of all women reported any knowledge of sexually transmitted infections (STIs). This program meets the needs of a particularly underserved and hard-to-reach group, with a new contraceptive method, in a new way. The peer promoters hail from 15 different small communities within the region and are providing a brand new range of services to their peers. They meet weekly at a central clinic location to discuss challenges and attend trainings. There, CEMOPLAF also provides lunch, transportation costs and job-skills training. For more information on Planned Parenthood Federation of America, click here. To learn more about CEMOPLAF, click here. Click here to see a previous post on this blog about a policy discussion at the Woodrow Wilson International Center for Scholars in Washington DC on health workers and task-shifting.